The B2BE range has been designed as a cost-effective antenna to provide longer range coverage for 433 | 868MHz ISM band applications. The omni-directional radiation pattern allows the antenna to be quickly installed. This antennas provides an ideal solution for infill coverage, or to improve gain for a subscriber installation. 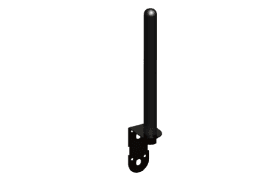 Optional wall or bracket mount. Antenna comes with 5m cable and SMA connector, and provides 2dBi gain.